One easy way to improve the performance of an assembly is to reduce the number of constraints Inventor needs to manage and calculate when performing an update. 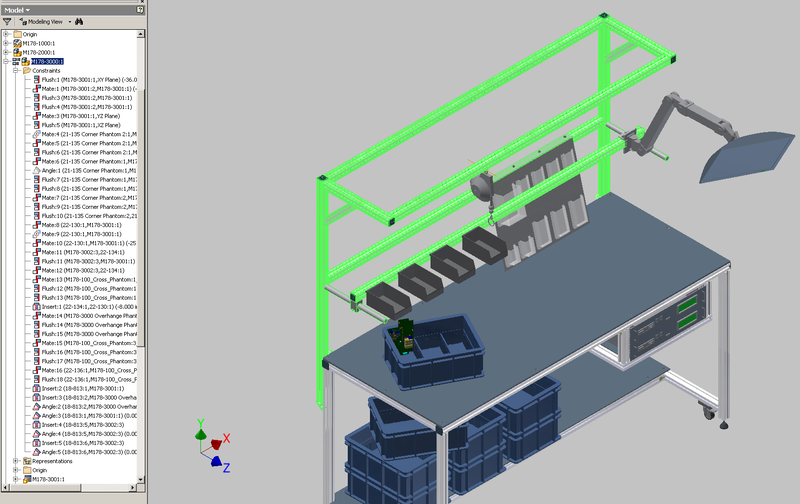 I understand that we need constraints to effectively position and control our assemblies, but once the components are positioned we can often suppress those constraints and ground the components to keep them in place. Here are some instructions to perform this task easily. Once your assembly is opened, you need to decide which constraints can be suppressed and which ones are needed. If you need to drive a constraint or show any type of motion in the model then you will want to keep the constraint. Any components that are static and do not move can be grounded and their constraints be suppressed. I tend not to delete them just in case I ever need to make a change to the offset or angle. I can then just unsuppress and unground the constraint to make my change. Look at the model tree of the framework in the image below. Notice the long list of constraints in the model. None of these frame components would ever have motion, so this is a perfect place to suppress and ground. Other components such as the LCD arm you may want to keep the constraints so you can animate how the model works. The first this we want to do is ground all the components in that sub assembly. To do this we will edit the sub assembly. Next select all the components in the tree except the patterns. Then right click and select Grounded. If you have patterns in the tree you will also want to suppress the components of the first element only in each pattern. 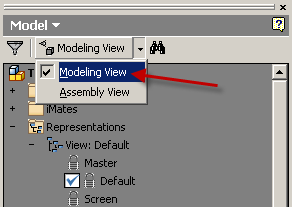 Next switch to Modeling View. You will now see a folder in the tree that says constraints (if you use imates you will see a folder for imates as well). Expand the constraints folder and select all the constraints. Finally right click on the selection and select suppress as shown below. If you use imates repeat these steps for the imate folder. If some of the constraints were already suppressed then you can either unselect them, or right click and suppress until they are all suppressed. At any time you can unsuppress individual constraints to make adjustments. This subassembly will now update in a fraction of the time because there are no constraints to suppress. You may even want to create a Positional Representations to do this. You could have one Representation where the components are grounded and the constraints are suppressed, then have another Representation where the model has the constraints active and the components ungrounded. I hope this Tip has helped you with assembly model performance. Stay tuned for future tips and tricks. John Kavusak has worked at Synergis for over 6 years and is a Manufacturing Solutions Engineer focused on Inventor, iLogic, Showcase, Alias and Autodesk Data Management Solutoins. He has previos work experience as an IT and CAD Administrator and a Project Engineer. He is an Autodesk Inventor Certified Professional. He has over 15 years experience with AutoCAD, Mechanical Desktop, and Inventor. You can read more about John on LinkedIn. Contact us, visit the Synergis Website or subscribe to the blog.